Nikita 'Lovely Shoes' Khrushchev, ☭, also known as Nicky Blue Eyes (April 17th 1894 - September 9th 1971), was the Soviet Premier and leader of the Soviet Union from the death of Josef Stalin until his forced retirement in 1964, due to the risk of aggravating a very delicate health condition by being shot at by naughty Commissars. 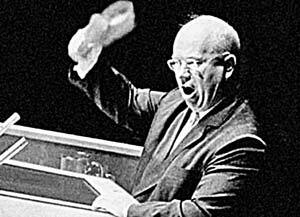 Khrushchev's decrees consisted mainly of economic policies, angry shoe-banging at the United Nations and waving at Soviet peasants during parades. Deeply in love with the Soviet way of life, Khrushchev is credited with various attempts to export the typical Soviet inefficiency around the world, most notably in Cuba and the Communist Republic of Canada. He is also famous for having denounced Stalin's egregious record on human rights. For those without comedic tastes, the so-called experts at Wikipedia have an article about Nikita Khrushchev. Khrushchev was the thinker behind the Warsaw Pact, a corporate alliance to increase worldwide sales of shoes and corn. An accomplished athlete and shot-putter, he personally lobbed Sputnik from a lavatory window in the Kremlin and was also involved in the launch of Yuri Gagarin to kingdom come. Unfortunately, he supported the disastrous deployment of missiles in Cuba during the missile crisis which hit the Caribbean island during one of Castro's bouts of impotence. He also used his political powers to grant friends profiteering contracts, which led to the building of miles of useless walls, alternative medicine centers and a vast navy. The young worker flying the flag of freedom. Note the superiority of the Socialist system, evident in the redness of the Communist ideology shining through the dreary grayness of decaying Capitalism, testifying the true emotional power of the Soviet system. Shrouded in the capitalist haze of the decadent Bourgeois regime, little is known of Comrade Khrushchev's childhood, except that it was gloriously proletarian in tone. Son of men who had always been peasants, he worked in various wood factories and mines, there understanding the weakness of the capitalist base and superstructure...an understanding which revolted the tender, socialist heart of Nikita and made him bay for capitalist blood. Joining a trade union in World War I and at the forefront of the Bolshevik revolution, he fought in the Red Army, personally slaying hundreds upon hundreds of nasty little capitalists. He became a Party member and toiled for the achievement of Communism at various management and Party positions in Dumbass and Kiev. "What do you mean, 'Guns or Butter'? We Want Shoes, Shoes and Corn cobs!" - Comrade Khrushchev's appeal to the proletariat. Note the superiority of the Socialist system, evident in the well balanced shoe, held intrepidly in hand, wafting airs of Socialist Realism in the decadent halls of Western Capitalist power. Comrade Khrushchev's rise resulted from the inherent virtue of socialism: under this most glorious and equal system, everyone is rewarded. In fact, upon the death of Joseph Stalin, Khrushchev proceeded to reward himself with the leadership of the Party and many other lucky party members with deportations holiday coupons to Kamchatka, Novosibirsk, Siberia and other soviet tourist resorts. As time went by, Khrushchev found himself unable to make the Great Purges which made Stalin's rule glorious and so, in agreement with the Politicheskoye Buro and other such vanguards of the people, he decided to focus on something that would really strengthen the Soviet Union and his grip on power: Sending a thing that went BEEP in hyperspace. The Soviet masses, already delighted by the many achievements of the superior Soviet system, rejoiced at this major step in achieving Communism. Believing that there was always room for improvement in the Soviet Union, and using his shot-putting talent, Khrushchev then went on to throw into orbit a dog, a chimp, a horse and a man as well. Advances in Soviet Space technology sent the decadent West careering into confusion and despair. This culminated in the famous face-off between Kennedy and Khrushchev in the Cuban Missile Crisis, a disagreement on Soviet involvement in the delicate Cuban real-estate market. This led to fears of Global Thermonuclear War in the West and widespread shortages miscalibration of the commodity supply chain in the Soviet Bloc. While America remained in the grips of her nuclear fears until the end of the Cold War, the Soviet Union liquidated every fear it had of consumer goods shortages, after an inspirational appeal to the proletariat of the world by Comrade Khrushchev. 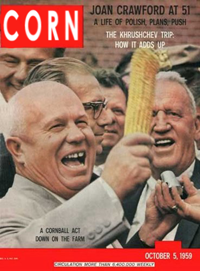 - Corn Magazine detailing Khrushchev's love affair with a corn cob. Note the superiority of the Socialist system, evident in the way in which Comrade Khrushchev waves a corn cob at the masses of hungry happy Soviet people. Somewhat resentful Wishing to emulate the success of Stalin's Five Year Plans, Comrade Khrushchev set out his own economic agenda to improve the economy. Many peasants believed that the famine, food shortages and related problems shortcomings encountered in the supply of food in their glorious nation resulted from corrupt bureaucrats the subversive action of rich landowners. After many years of deep studies, thousands of resentful peasants killed, millions spent in food-rationing coupons and a painful ruble debasement, the glorious Bureau for Economic Planning and Improvement within the celebrated branch of the Soviet Commissary for Finance and Economics, part of the most-Soviet Board of United Financial Soviets, completed its magnum opus, a three-page report stating that to solve the recurring famines issues the Soviet economy had to either decrease demand or increase supply. Khrushchev was amazed by this incredible revelation and breakthrough in economics, but mustering enough soldiers to liquidate three-quarters of the peasant population was beyond his means. Comrade Khrushchev had to find other ways to decrease demand. Angry and frustrated, he removed his shoe and started to bang it on his desk, something he learned in a New York massage parlour, while he massaged his ingrown corns and toenails, another something he learned at the same massage parlour. At that instant, Comrade Khrushchev realized that the solution had been always in front of him: More shoes and more corn for the people. All the resources of the proletariat were directed to the production of these two fundamental products - Shoes and corn for the masses. Surpluses of corn and shoes proved to be so enormous that corn soon started to fuel almost everything in the Soviet Union, from ships to aircraft, and tractors too; shoes were shipped to New York, to be used by UN Soviet Envoys to make themselves noticed or to bury other envoys under tons of Soviet boots. Dizzy with success, and having lost clearness of mind and sobriety of vision, the Soviet victory immediately began to promote social revolution amongst the First and Third World. The success of the Shoe and Corn Policy was however eclipsed some twenty tears later by Mikhail Gorbachev's famed Glass and Pears policy, Glassnost and Pearestroika. The sole surviving poster announcing an upcoming party for Communists. Inexplicably, Khrushchev and his shoe were left completely out! 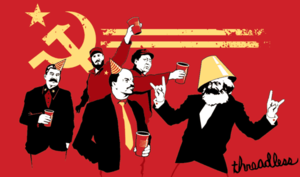 Note the superiority of the Socialist system, evident in the red background and imponderable level of joy found on the faces of many party participants. 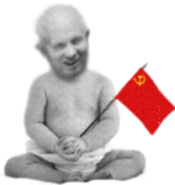 Post-Soviet revisionism has led to a serious psychological study of Nikita Khrushchev's mind. The third leader of the Soviet Union after Vladimir 'I Started Everything' Lenin and Joseph 'I Killed Everything' Stalin, Khrushchev comes across as a weak, undecided old revolutionary, harking back to the happy days of the Bolshevik Revolution but unable to make them happen again. This led to severe instances of sibling rivalry and animosity towards his predecessors. In fact, Khrushchev's ruthless hate of Stalin turned the meek, shy and loveable Georgian intellectual into the preposterously bloodthirsty assassin and mass-murderer we know of today. The Anti-Stalin Propaganda was so successful that the myths of millions of deaths committed by Stalin persist to this day. 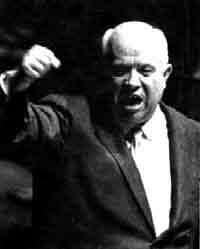 Comrade Khrushchev suffered periods of severe depression, throwing temper tantrums comparable only to Great Grandfather Marx's himself. Most famous of these outbursts came upon discovering that he had been left out of a special poster promoting an upcoming party at the Lubyanka. The offending poster was banned by the Supreme Soviet and declared unpatriotic, a move which raised many eyebrows in the Soviet Union. 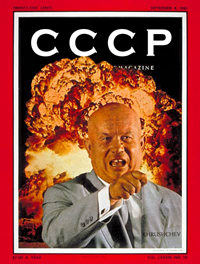 Khrushchev's bouts of sibling rivalry may have involved aggressive behaviour, peaking with the removal of Comrade Stalin from the popular children's book My Big Golden Sticker-Book of Great & Generous Communist Leaders however his problems were nothing when compared with the disastrous immaturity of his successor, Leonid Brezhnev. Knowing that jealousy knew no limits in the West, Comrade Khrushchev secretly believed in peace, standing for happiness, loving the smell of freshly mown grass, flowers and the odd shot of vodka or two. However, Khrushchev's plans to make the rest of the World realize the error of its Capitalist ways and accept the superiority of the Socialist system foundered with the success of the coup against him humble resignation petition by a bloodthirsty meek group of Party members and Commissars. Happy enough with his De-Stalinization of Soviet Union, his success in sending lots of antiques in Space and his economic moves to increase the supply of shoes and corn, Khrushchev joyfully accepted the plea for him to retire happily to a gulag colony of Happy Communists in Siberia. However, since there was a shortage of train-engines and tractors, Khrushchev had to make do with house arrest home retirement. To guard him from excessive fan attention, the KGB is said to have graciously provided a security detail service for Comrade Khrushchev. This was done to protect him from any disturbance while he wrote his memoirs, and later when he embarked upon a successful career as a reporter for the aptly named Soviet magazine, CCCP. After further successes, he died on September 11th, 1971 and went to join the great red Party in the sky, the only Soviet approved place where die-hard Communists allow themselves to go after death. ↑ The KGB thinks that the revolution itself is a perpetual teacher and those who fought for the liberation of the Russian peasants can testify as to how many can fall by the wayside as the revolution winds its way, driven by the invincible power of the masses! Ле́нин LIVES! ↑ Before trying to convert them to Communism, obviously. ↑ Comrade, are you sure it's Dumbass and not Donbas? Have it checked by the Commissar for Placenames! ↑ Тиїѕ Ғооҭпоҭє Іѕ Яєаllў Д Раҭиєҭіϲ Зхсџѕє То Цѕє ЄУЯЯЇLLЇЄ Lєҭҭєяs! ↑ The KGB believes this statement is a form of dissent; the knocks at your door are not part of any crack down on all forms of dissent...so go open the door for us, will you? ↑ The KGB states that these views are slanderous fabrications by the tottering Capitalist regimes. They have been included in the article to highlight the democratic credentials that underline the glorious superiority of the Soviet system. ↑ Later suppressed as subversive for including pictures of Brezhnev and Honecker making out. This page was last edited on 15 June 2017, at 20:20.